Institute of Biomedical Engineering, School of Preclinical and Forensic Medicine, Sichuan University, Chengdu 610041, China. Interleukin-8 (IL-8) is a common inflammatory factor, which involves in various non-specific pathological processes of inflammation. It has been found that increased endothelial permeability accompanied with high expression of IL-8 at site of injured endothelium and atherosclerotic plaque at early stages, suggesting that IL-8 participated in regulating endothelial permeability in the developing processes of vascular disease. The purpose of this study is to investigate the regulation effects of IL-8 on the vascular endothelial permeability, and the mRNA and protein expression of tight junction components (i.e., ZO-1, Claudin-5 and Occludin). Endothelial cells were stimulated by IL-8 with the dose of 50, 100 and 200 ng/mL, and duration of 2, 4, 6, 8h, respectively. The mRNA and protein expression level of tight junction components with IL-8 under different concentration and duration was examined by RT-PCR and Western blot, respectively. Meanwhile, the integrins induced focal adhesions event with IL-8 stimulation was also investigated. The results showed that IL-8 regulated the permeability of endothelium by down-regulation of tight junction in a dose- and time-dependence manner, but was not by integrins induced focal adhesions. This finding reveals the molecular mechanism in the increase of endothelial cell permeability induced by IL-8, which is expected to provide a new idea as a therapeutic target in vascular diseases. Keywords: Endothelial permeability, IL-8, Tight junction, Occludin, Claudin-5, ZO-1. Vascular endothelium is a semipermeable membrane, which could separate the inner and outer of vessel and regulate the exchange of dissolved gases, ions and solutes between the inner and outer of vascular endothelium as an important barrier function . The maintenance by the endothelium of a semi-permeable barrier is particularly essential for establishing the transendothelial protein gradient and maintaining the normal physiological functions of organs. The elevated permeability of endothelium means that it in part lost semipermeable characteristics, which is a crucial pathological phenomenon involved in the development of diseases, including heart and lung edema , tumor angiogenesis  and shock [4-5]. Moreover, the loss of endothelial barrier function is the hallmark of inflammatory diseases such as atherosclerosis . The dynamic equilibrium between cell adhesion and cytoskeleton contraction plays an important role in maintaining the normal function of endothelial permeability. It is known that intercellular junction, as an important structural basis of endothelial cell permeability, is mediated by adhesion structures, which can be divided into tight junction, gap junction and adherent junction . The function of gap junction involved in transmitting biochemical information among adjacent endothelial cells, while tight junction and adherent junction contributed to macromolecules transport. Tight junction is located in the top side of the gap of adjacent cells, which is formed with a variety of proteins, and plays a critical role in the maintenance of stable internal environment and the normal functions of body . Changes in vascular permeability may result from alterations of the tight junction components. Tight junction is composed of a combination of more than 40 proteins including the transmembrane proteins Occludin, the Claudin family, the junction adhesion molecule (JAM) family, and peripheral membrane-associated Zonula occludens (ZO) family . Evidences have been provided for the presence of Occludin, Claudin-5, ZO-1, and JAM-A in vascular endothelium [9-11]. Therefore, changes in Occludin, Claudin-5, and ZO-1 likely contribute to alterations in vascular endothelial permeability in response to stimulation of inflammatory cytokines. On the other hand, the barrier function of tight junctions regulates the passage of ions, water, and various macromolecules, even if cancer cells, through paracellular spaces to maintain tissue homeostasis. The vascular endothelium is a monolayer comprising of not only endothelial cells but also extracellular matrix (ECM) proteins, indicating that under normal conditions the permeability of the endothelium depends on the combined properties of the cell layer and the ECM barriers in series . ECM proteins, including fibronectin (FN), laminin (LN), vitronectin (VN) and collagens (Col), bind to extracellular domains of integrin α subunits receptors on cell membrane, and transduce signals from extracellular stimuli to intracellular events. Around activated integrin clusters on the cell membrane, cytoskeletal proteins (Talin, Paxillin, Vinculin and so on) as the ligands of integrin β cytoplasmic tails, assemble together to form focal adhesion (FA) plaques and provide enough supports for cell adhesion on the substrate. Vinculin frequently links adhesion receptors (e.g. integrins) to the contractile actin-myosin cytoskeleton by binding either talin through its amino-terminal globular head domain, or Paxillin through its rod-like tail domain . Therefore, both cell-cell junction and cell-ECM adhesion likely contribute to endothelial barrier function . The endothelial permeability is regulated by a variety of chemical and biological factors. Of these factors, the adhesion molecules, MCP-1, IL-8 and other chemotactic cytokines play key roles. IL-8 is a chemokine that increases endothelial permeability during early stages of angiogenesis, which involved in various non-specific inflammation pathological processes . Some reports have proved that IL-8 has extensive functions in defensive reaction, immune reactions as well as inflammation . Preliminary studies showed that IL-8 could activate the vascular endothelial cells and induce migration behaviors [16-17], and there was a high expression of IL-8 at endothelial cell injury and the atherosclerotic plaque . It has been reported that IL-8 induced endothelial permeability required the activation of vascular endothelial growth factor receptor-2 (VEGFR2) . Therefore, the question raised to us is how tight junction proteins would be changed involved in IL-8 induced permeability. In this study, endothelial cells were stimulated by IL-8 with the doses of 50, 100 and 200 ng/mL for 2, 4, 6 and 8 h, respectively. The changes of tight junction proteins (Occludin, Claudin-5 and ZO-1) in IL-8 stimulated endothelial cells were examined. In addition, the proteins expression of integrins (α2, α5, β1 and β3 subunits) and focal adhesion complexes (Talin, Vinculin and Paxillin) were examined to determine if integrins and their downstream signals participate in permeability changes mediated by IL-8. Human vascular endothelial cell lines, EA.hy926 cells (provided by Hematology Research Institute of Jiangsu Province, China) were used in this study, which are hybridoma cell lines between human umbilical vein endothelial cells (HUVECs) and the epithelioma A549 cells, and retain most features of HUVECs, including the expression of endothelial adhesion molecules and human factor Ⅷ-related antigen. EA.hy926 cells were cultured in RPMI1640 medium (Invitrogen Company, USA) supplemented with 10% fetal bovine serum (FBS, Hangzhou Sijiqing Biological Engineering Materials Co., Ltd., China), 20 mmol/L HEPES (Sigma, USA), 2‰ NaHCO3 and 2% HAT (Sigma, USA). The cells were maintained in a 5% CO2 incubator at 37°C. Human IL-8 was purchased from Millipore Chemicon Corporation (Billerica, MA, USA). The primary antibodies of tight junction proteins including anti-Claudin-5 (H-52) rabbit polyclonal Ab (sc-28670), anti-Occludin (F-7) mouse monoclonal Ab (sc-271842) and anti-ZO-1 (H-300) rabbit polyclonal Ab (sc-10804); the primary antibodies of integrins subunits, including anti-integrin α2 (C-9) mouse monoclonal Ab (sc-74466), anti-integrin α5 (A-11) mouse monoclonal Ab (sc-166665), anti-integrin β1 (A-4) mouse monoclonal Ab (sc-374429), anti-integrin β3 (B-7) mouse monoclonal Ab (sc-466655); the primary antibodies of focal adhesion complexes, including anti-Vinculin (G-11) mouse monoclonal Ab (sc-55465), anti-Talin (8D4) mouse monoclonal Ab (sc-59881), anti-Paxillin (D-9) mouse monoclonal Ab (sc-365174) and anti-pPaxillin (Tyr 118) rabbit polyclonal Ab (sc-101774), E-cadherin (67A4) mouse monoclonal Ab (sc-21791) and N-cadherin (H-63) rabbit polyclonal Ab (sc-7939) were purchased from Santa CurzTM Biotechnology, Inc (CA, USA). The peroxidase-conjugated goat anti-mouse IgG and goat anti-rabbit IgG (secondary antibodies) were purchased from Dingguo Biotechnology Co., LTD (Beijing, China). where [Ca] was the abluminal concentration; t was time (s); S was the area of membrane(cm2); V was the volume of luminal chamber, and [Cl] was the luminal concentration . EA.hy926 cells with almost 100% confluence were treated by IL-8 with different concentrations (0 ng/mL as controls, 50, 100 and 200 ng/mL) and durations (100 ng/ml IL-8 treated for 2, 4, 6 and 8 h), respectively. At each time point, the cells were washed twice with PBS, and fixed with 4% paraformaldehyde for 15 min at room temperature. Cells were incubated in the BODIPY FL Phallotoxins solution (with 1:100 dilution, InvitrogenTM, USA) for 90 min, the DAPI (4', 6'- diamidino-2-phenylindole) with 1:800 dilution was added for nuclei staining for 30 min. Each step was followed by washing with PBS for 5 min for less three times. Using a laser scanning confocal microscope (Leica TCS SP5, Germany), the morphologies and gaps among all groups indicated endothelial permeability were examined. For transmission electron microscope (TEM) observation, samples were treated by IL-8 and gently collected by a plastic cell scrapper (Corning, USA) to maintain origin cell-cell junction. The samples were centrifuged at 1,500 rpm for 10 min, fixed with 0.5% glutaraldehyde, and stored at 4°C for 10 min. Then, the samples were centrifuged again at 12,000 rpm for 10 min; the supernatant was discarded and 3% glutaraldehyde was added slowly. All samples were fixed by 1% OsO4, dehydrated by different concentration of acetone, embedded by epoxy resin (Epon812), cut into slices and doubled dyed by uranyl acetate and lead citrate. The micro-structure of cell-cell junctions were observed by TEM (H-600IV, Japan). The mRNA expressions of occludin, claudin-5 and ZO-1 were semi- quantitatively determined by RT-PCR assays. Total RNA was extracted from the cells by using the TRIzol reagent (Invitrogen Company, USA). First-strand cDNA was synthesized by using the Revert Aid™ Frist Strand cDNA Synthesis System (Fermentas). RT-PCR was carried out by using the TaKaRa One Step RNA PCR Kit (AMV) (TaKaRa, Dalian, China) according to the manufacturer's instructions. To obtain the relative quantitative values for gene expression, β-actin was used as the endogenous control. Sequences of the primers used for RT-PCR listed in Table 1 were designed by Invitrogen Company (USA). The reaction conditions were as follows: incubation at 95°C for 3min, denaturation at 95°C for 30 s, annealing at 53°C (occludin), 56°C (claudin-5), 52°C (ZO-1) or 55°C (β-actin) for 30s, and polymerization at 72°C for 60s for 22 cycles, followed by a final extension at 72°C for 10 min. The PCR products were visualized by electrophoresis on a 1% agarose gel in 1×Tris-acetate-EDTA (TAE) buffer after staining with 0.5 μg·ml-1 ethidium bromide. All electrophoresis images were quantitatively analyzed by using Gel-Pro Analyzer 4.5 software and normalized to their respective β-actin values. EA.hy 926 cells were plated on small circular slides respectively with 50% confluent and serum starved overnight, and then treated with IL-8 for various concentrations (50, 100 and 200 ng/ml) and durations (2, 4, 6 and 8h), respectively. Then cells were washed twice each with PBS for 5 min, fixed with 4% paraformaldehyde in PBS for 8 min, washed three times each with PBS for 5 min. Cells were pre-incubated with 1% BSA in PBS for 15 min to decrease non-specific antibody binding and washed for 30s to 1 min with PBS. Primary antibodies incubation (Occludin and ZO-1, E-cadherin and N-cadherin) was performed at 4°C overnight and slides were washed for 5 min with PBS for 3 times, and further incubated for 90 min in FITC-conjugated goat anti-mouse antibody and PE-conjugated goat anti-rabbit antibody, and then incubated with DAPI (4' 6'-diamidino-2-phenylindole) that stained nuclei for 30 min at 37°C. Samples were sealed by 10% glycerol, kept from light and observed by laser scanning confocal microscope (Leica TCS SP5, Germany). All experiments repeated 3 times at least (n=3). Means, together with standard deviations, were calculated for the experimental and control groups. One-Way ANOVA with Duncan's new multiple range method was performed by using data analysis software of SPSS12.0 (SPSS, Inc., Chicago, Illinois). The results were expressed as means ± S.D. The P values were calculated to test the level of statistical significance. The differences were considered significant at P < 0.05. The tightness degree of the tight junctions was evaluated by Transwell assay. Endothelial monolayer were cultured in Matrigel-coated transwells and treated with IL-8. FITC-labeled bovine serum albumin was penetrated due to increased endothelial permeability induced by IL-8. The fluorescence intensity was quantified and permeability coefficient (Pa) was calculated according to the formula in previous section, and the results were showed in Fig.1. It could be seen that the permeability coefficient, Pa, was gradually increased with the concentration (from 0 to 200 ng/ml, Fig.1A) and duration (from 0 to 8h, Fig.1B) of IL-8. Under the concentration of 100 ng/ml and 200 ng/ml IL-8 stimulated for 4h, the Pa was higher than that under 0 (as controls) and 50 ng/ml (P< 0.05). As to different treated duration, the Pa under 100 ng/ml IL-8 stimulated for 4, 6, 8 h was higher than that under stimulated for 0 h (controls) and 2 h (P<0.05), respectively. 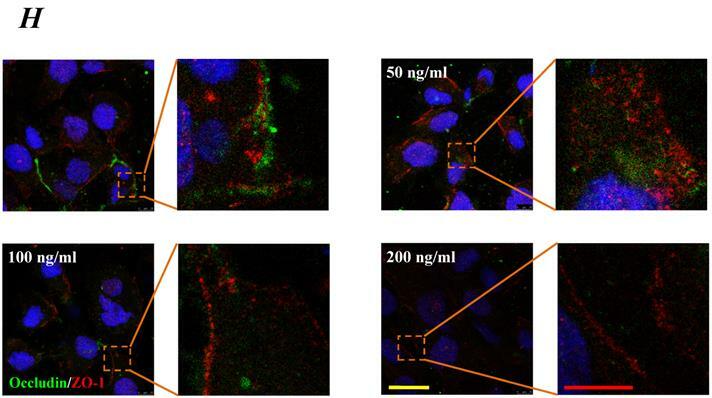 These results confirmed the change of endothelium permeability stimulated by IL-8 exhibited dose and time-dependent manners. The morphologic changes of endothelial permeability with different concentrations of IL-8 were observed by laser confocal microscopy. After the IL-8 concentration increased from 50 to 200 ng/ml, gaps were observed between adjacent endothelial cells, correlating increased endothelial permeability with gap formation (white arrows indicated in Fig.2). We further checked the gap at cell-cell junctions by TEM observation, and the elevated distance could be clearly found with increase of concentration and treated duration of IL-8 among single cells (black arrows indicated in Fig.3). Based on the physical and morphological results, both dose and time-dependent manners were concluded in IL-8 induced endothelial permeability. We supposed that IL-8-induced permeability was dependent upon regulation of tight junction proteins. Three classes of proteins are known to localize to tight junctions, including claudins, occludin and junction adhesion molecules. The claudin expression is highly restricted to specific regions of different tissues and may have an important role in transcellular transport through tight junctions. Occludin is an integral membrane protein closely associated with the tight junctions of endothelial cells. Therefore, the mRNA and proteins expression of occludin, claudin-5 and ZO-1 were investigated. To determine the effect of IL-8 with different concentrations and treated durations on mRNA and proteins expression of specific tight junction components, cells were exposed to 50, 100, 200 ng/ml IL-8 for 2h, and 100 ng/ml IL-8 for 2, 4, 6 8h, respectively. The mRNA and proteins expression level of occludin, claudin-5 and ZO-1 were further examined by RT-PCR and Western blotting analysis, respectively. Fig.4A showed the effect of IL-8 with various treated durations (from 2h to 8h) and concentrations (from 50 to 200 ng/ml) on mRNA expression of occludin, claudin-5 and ZO-1. According to the PCR bands in Fig.4A, it could be found the endothelial cells treated with increased concentration of IL-8 down-regulated the mRNA expression of occludin, claudin-5 and ZO-1, and the increased treated duration of IL-8 also showed significant decrease mRNA expression of these proteins (Fig.4B, C and D). The changes of endothelial permeability induced by IL-8 exhibited dose- and time-dependent manners. Permeability assay was perform as depicted in 2.1, and coefficient (Pa) in groups was calculated by formula Pa = [Ca]/t ×1/S ×V/[Cl]. (A) The transwell cultured with endothelium were treated with 50, 100 and 200 ng/ml IL-8, respectively. (B) The transwell cultured with endothelium were treated with 200 ng/ml IL-8 for 2, 4, 6 and 8h, respectively. Values represented the mean±S.E (n=3). *, P<0.05 denoted statistically significant difference compares to control. Cultured cells treated with 0 (as controls), 50, 100 and 200 ng/ml IL-8 for 4h were stained with F-actin, and examined by laser confocal microscopy. The white arrows in figures showed visible cell-cell gaps formation. Scale bar in all images = 25 μm. 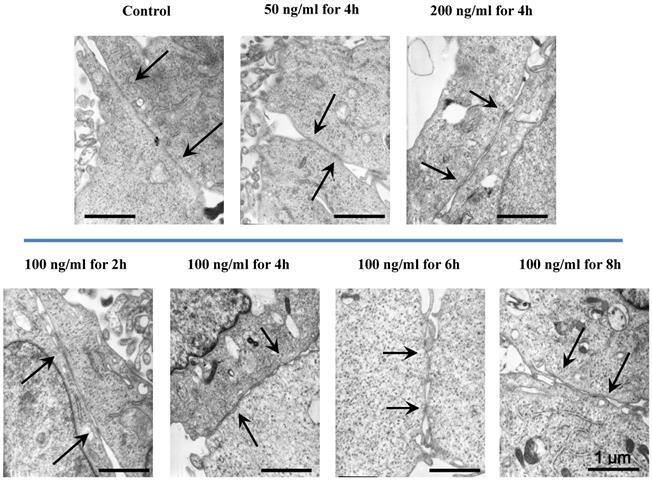 TEM images showed the different concentrations (50, 100 and 200 ng/ml) and treated durations (2, 4, 6 and 8h) of IL-8 on cell-cell junctions morphology. The black arrows in figures showed the junctions and gaps between two cells. Scale bar in all images = 1 μm. The effect of IL-8 on occludin, claudin-5 and ZO-1 mRNA expression. 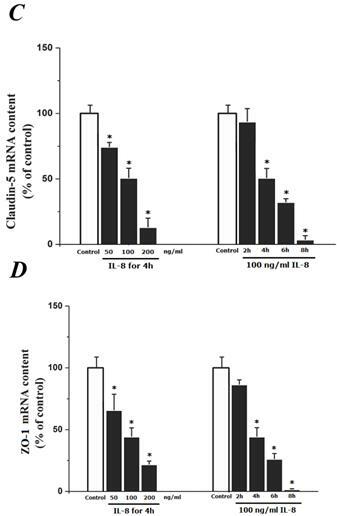 IL-8 induced tight junction permeability in endothelium with decreased mRNA level of occludin, claudin-5 and ZO-1 in a dose- and time-dependence manner. (A) Representative bands of tight junction mRNA expression. (B), (C) and (D) The level of β-actin in each group was used as intrinsic controls, and relative expression mRNA of occludin, claudin-5 and ZO-1 were calculated, respectively. Values represented the mean±S.D. (n=3). *, P<0.05 denoted statistically significant difference compares to control. 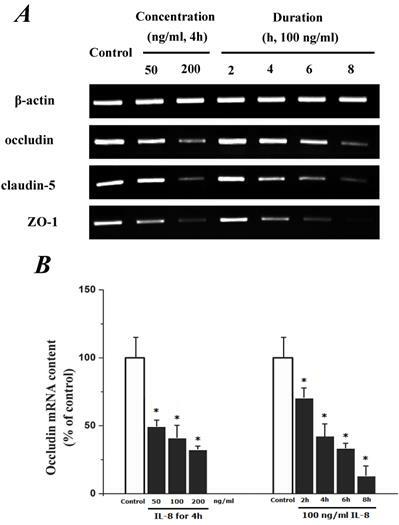 The expression levels of Occludin, Claudin-5 and ZO-1 proteins were further determined by Western blotting, and the results were showed in Fig.5. Similar to the results of mRNA expression, the expression level of Occludin, Claudin-5 and ZO-1 proteins decreased with higher concentration and longer duration of IL-8, and showed a dose- and time-dependence (Fig.5A). With increased treated concentration to 100-200 ng/ml, the expression level of Occludin, Claudin-5 and ZO-1 proteins are weaker than that of control (Fig.5 B, C&D). As to treated duration, 100 ng/ml IL-8 significantly decreased Occludin after 4h (P<0.05, Fig. 5E), and IL-8 reduced Claudin-5 expression at 4, 6, 8h showed a significant difference compare to control (0h) and 2h (P<0.05, Fig. 5F); only ZO-1 expression level showed a significant difference compare to control from initial 2h (Fig.5G). Furthermore, the distribution of Occludin and ZO-1 in different concentration of IL-8 treatment was examined by double immunofluorescence staining (Fig. 5H). The expression levels of Occludin and ZO-1 were consistent with the results of Western blot. It could be found that the Occludin (green) and ZO-1 (red) localized at the cell border in control group, and IL-8 significantly decreases tight junction contents. Under IL-8 treatment, a loss of Occludin and ZO-1 was found, showing that the effect of IL-8 on Occludin was more pronounced. The ZO-1 showed the decreased level but still distributed at the edge of cells (200 ng/ml group in Fig. 5H), while a diffuse cytoplasmic distribution of Occludin was gradually observed in cells with increased concentration of IL-8. These results confirmed that IL-8 induced permeability is dependent upon down-regulation of mRNA and proteins of tight junctions. The effect of IL-8 with different concentrations and treated durations on the protein expression and distribution of tight junction contents. IL-8 induces tight junction permeability in endothelium with decreased expression level of Occludin, Claudin-5 and ZO-1. (A) Representative western blot of tight junction proteins expression. Quantification of each protein expression level by image analysis of the western blot bands in fig A. The expression level of β-actin in each group was used as intrinsic controls, and relative expression were calculated. (B-D) The expression level of Occludin, Claudin-5 and ZO-1 with different doses of IL-8 (50, 100 and 200 ng/ml) for 2h. (E-G) The expression level of Occludin, Claudin-5 and ZO-1 with 100 ng/ml IL-8 for 2, 4, 6 and 8h, respectively. Values represented the mean±S.D. (n=3). *, P<0.05 denoted statistically significant difference compared to control. (H) Double-labeled immunofluorescence analyzed the effects of increased concentration of IL-8 on distribution and expression of ZO-1 (red) and Occludin (green) proteins, enlarged images of designated regions, labeled by square frames (blue: DAPIstained nucleus). Yellow scale bar = 25 μm. The cadherin, major members of Ca2+-dependent adhesion molecules that form adherent junctions and function to mediate cell-cell binding critical to the maintenance of tissue structure. 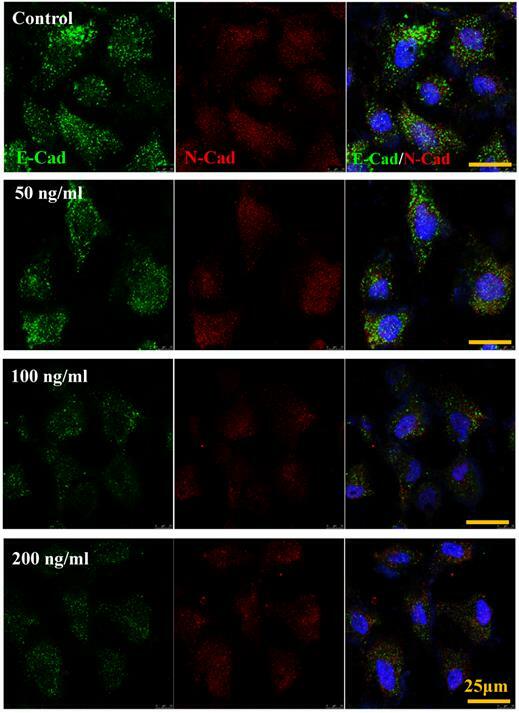 E-cadherin (E-Cad) and N-cadherin (N-Cad) share many structural and functional features, which establish Ca2+-dependent homophilic cell-cell adhesion with their extracellular domains and connect with catenin at their intracellular domains . In this study, the effect of increased IL-8 concentration on expression and distribution of E-Cad and N-Cad was examined by immunofluorescence. As shown in Fig.6, increased dose of IL-8 could markedly reduce the expression of E-Cad, but did not affect N-Cad expression. There are no obvious changes of localization could be found. The result suggested that potential effect of IL-8 mediating endothelial permeability by down-regulation of adherent junction. Integrin, which is a family of extracellular matrix receptors, transduces signaling from the outside ECM to the inside cell and regulate many aspects of cell behavior. Integrins are bound to ECM at specific cellular sites, named “focal contacts” or “focal adhesions” that are responsible for the adhesive interactions of the endothelial cell monolayer with ECM. The integrin α2β1, α5β1 and αvβ3, the primary receptors of VN, FN, LN and Col, are widespread in many cells. The integrins mediate dynamic interactions between the extracellular matrix and the actin cytoskeleton. 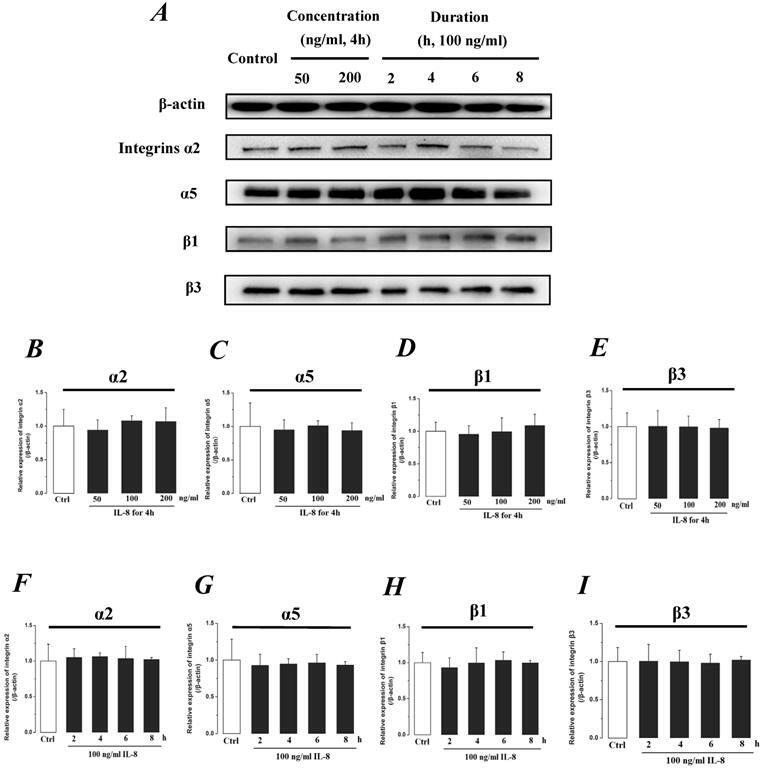 In this study, the effect of IL-8 on the expression of integrins subunits α2, α5, β1 and β3 were respectively examined, and the results were showed in Fig.7. It could be seen from Fig.7, there was no significant difference of integrin subunits (α2, α5, β1 and β3) expression level among all samples under increased concentration (P>0.05, Fig.7 B, C, D & E) and treated duration (P>0.05, Fig.7 F, G, H & I) of IL-8. We further investigated the actin cytoskeleton by integrin cytoplasmic tail β binding proteins (Talin, Vinculin and Paxillin), which formed focal adhesions (FAs) cytoplasmic plaque implicated in regulation of the actin cytoskeleton (Fig.8). The phosphorylation of Paxillin upon integrin engagement or growth factor stimulation can create binding sites for the adapter protein and localize to focal adhesion. It could be found that the expression level of FA components exhibited less difference (P>0.05) with incremental concentration (Fig.8 B, C&D) and treated duration (Fig.8 E, F, &G) of IL-8. The ratio of phosphorylated Paxillin (pPax) in total Paxillin also showed less difference with various concentrations and durations of IL-8 treatment (Fig.8 H&I). These results suggested that the increased endothelial permeability induced by IL-8, was not dependent upon integrins-FAs pathway, and that IL-8 could not regulate the ECM and its interactions with the endothelium. IL-8 regulated the expression and distribution of E-Cad and N-Cad. Double-labeled immunofluorescence analyzed the effects of increased concentration (from 0 to 200 ng/ml) of IL-8 on distribution and expression of E-Cad (green) and N-Cad (red) proteins. (blue: DAPI stained nucleus). Yellow scale bar = 25 μm. The effect of IL-8 on the protein expression level of Integrin subunits, α2, α5, β1 and β3. There were not significant differences of expressions level of Integrin subunits treated by either concentration or duration of IL-8. (A) Representative Western blot bands of integrins expression. Quantification of each protein expression level by image analysis of the Western blot bands in fig A. The relative expression were calculated by expression level of β-actin in each group as intrinsic controls. (B-E) The expression level of Integrin subunits, α2, α5, β1, and β3 with different doses of IL-8 (50, 100 and 200 ng/ml) for 2h. (F-I) The expression level of Integrin subunits, α2, α5, β1, and β3 with 100 ng/ml IL-8 for 2, 4, 6 and 8h, respectively. Values represented the mean±S.D. (n=3). *, P<0.05 denoted statistically significant difference compared to control. 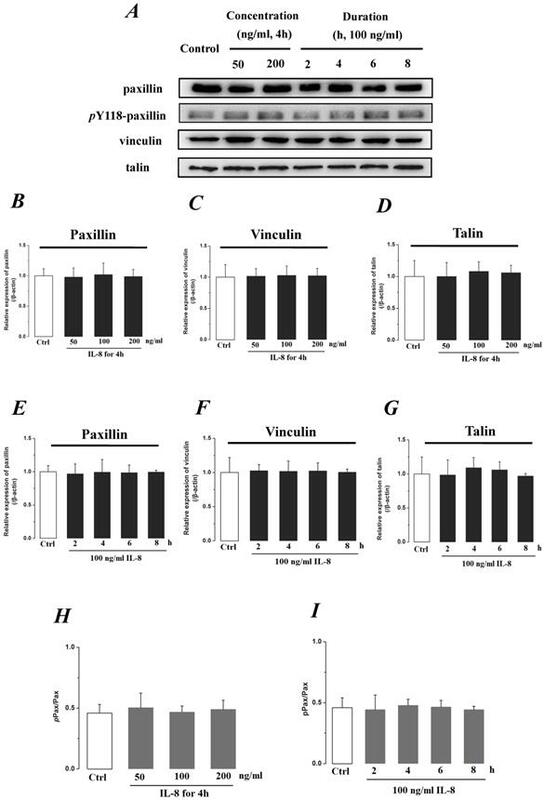 The effect of IL-8 on the protein expression of focal adhesion components, Paxillin, Vinculin and Talin. The expression levels of Paxillin, Vinculin and Talin were not changed by either concentration or duration of IL-8. (A) Representative Western blot bands of integrins expression. Quantification of each protein expression level by image analysis of the Western blot bands in fig A. The expression level of β-actin in each group was used as intrinsic controls, and relative expression were calculated. (B-D) The expression level of focal adhesion components, Paxillin, Vinculin and Talin with different doses of IL-8 (50, 100 and 200 ng/ml) for 2h. (E-G) The expression level of focal adhesion components with 100 ng/ml IL-8 for 2, 4, 6 and 8h, respectively. (H & I) The ratios of phosphorylated Paxillin (pPax) in total Paxillin (Pax) with different doses and treated durations of IL-8 were calculated and compared. Values represented the mean±S.D. (n=3). The vascular endothelial cell monolayer is localized at the critical interface between the blood and vessel wall, which has the vital functions of regulating balance and supplying the essential nutrients needed for the survival of the organism. The endothelium, which is composed of vascular endothelial cells, plays a central role in maintaining the vascular homeostasis by releasing endothelium-derived relaxing factor including prostacyclin (PGI2), nitric oxide (NO), and endothelium-derived contracting factor including platelet-activating factor (PAF) and endothelin-1 (ET-1) . The semi-permeable barrier of cell-cell junction could maintain exchange of macromolecules between the blood and tissue through interstitial space, which could be regulated by a lot of mediators such as thrombin, TNF-α, LPS, and chemokines . IL-8 is one of chemokines produced by macrophages and some epithelial cells. The primary biological effects of IL-8 are to recruit neutrophils to phagocytose the antigen, which triggers the antigen pattern toll-like receptors. Elevated levels of IL-8 have been found at site of injured endothelium and atherosclerotic plaque . In our previous studies, it was found that IL-8 could induce the expression changes of Rac1 and RhoA in a time-dependent way, mediate cytoskeletal rearrangement and regulate the ECs migration through the activation of phosphoinositide 3-kinase (PI3K)-Rac1/RhoA pathway , and that laminar shear stress could increase the mRNA level of IL-8 in a CXC chemokine receptors (CXCR1/CXCR2)-dependent way . Jovanovic et al  proved that IL-8 could regulate trophoblast cell (HTR-8/SVneo) migration in a dose-dependent way (from 0.5 to 5 ng/ml, but decreased with 10 ng/ml IL-8 addition) and increase expression levels of Integrins α5 and β1 subunits. Lee et al  found that knockdown of IL-8 could inhibit the migratory ability and decrease integrins αV and β3 expression in human chondrosarcoma cells lines (JJ012 and SW1353). In addition, it has been reported that Integrins (e.g. αV, α3, α4, β1, β5) participated in change of vascular permeability and endothelial barrier function by some drugs and growth factors such as cilengitide , pseudomonas aeruginosa , and VEGF [30-31]. However, in this study, our results showed that the expression levels of Integrins α2, α5, β1 and β3 were not changed with the concentration and duration of IL-8 addition, suggesting that the endothelial permeability regulated by IL-8 did not depend on integrins-induced signals. The possible reason is that different cell types result in inconsistent conclusions. In addition, recent studies showed that IL-8 signals played an essential role of acquisition and/or maintenance of the mesenchymal and invasive features in the epithelial-mesenchymal transition (EMT) of human carcinoma cells , and down-regulation of tight junction is associated with EMT in cancer cells . Emerging findings indicate that IL-8 promotes endothelial permeability by initiating the activation of CXCR2 , which could stimulate VEGFR phosphorylation in a transactivation manner . CXCR2 or VEGFR enhanced endothelial permeability via PI3K/Akt, Rho/Rock activation, actin polymerization and phosphorylations of VE-cadherin and Occludin, resulting in opening of adherent junctions and tight junctions . The activation of the PI3K/Akt pathway that inhibits GSK-3β blocking β-catenin and snail involved in EMT, and represses the expression of E-cadherin and tight junction . IL-8 stimulates PI3K through its G protein-linked receptor, CXCR2, providing a specific molecular targeted intervention in vascular permeability . The growth factor, VEGF has also been found that it induced Occludin degradation and regulated its phosphorylation and ubiquitination, but showed no effect on expression of claudin-5 . Interleukin-6 (IL-6) is also an interleukin that acts as both a pro-inflammatory and anti-inflammatory cytokine. Suzuki et al demonstrated IL-6 could increase Claudin-2 expression and regulate tight junction permeability in intestinal epithelium . Tai et al found that amyloid-β could down-regulate Occludin and increase permeability in human brain endothelial cells via MAPK signaling pathway, which is associated in vascular dysfunction of blood-brain barrier in Alzheimer's disease . Nag S. et al also demonstrated that blood-brain barrier breakdown showed a marked increase of caveolin-1, loss of Occludin and reduced localization of Claudin-5, and increased expression of caveolin-1 preceded the decreased expression of Occludin and Claudin-5 in tight junction . In addition, both IL-1β and TNF-α increased permeability in bovine retinal endothelial cells (BREC), and TNF-α signals significantly decreased the protein and mRNA of the tight junction proteins ZO-1 and Claudin-5, and altered the cellular localization of these tight junction proteins through PKCξ/NF-κB pathway , while IL-1β could increase intestinal epithelial tight junction permeability by an NF-κB-dependent increase in myosin L chain kinase (MLCK) gene transcription , which is mediated by MEK kinase (MEKK-1) in a canonical NF-κB pathway and NFκB inducing kinase (NIK) in an activation of the noncanonical NF-κB pathway . The permeability of the vascular barrier can be modified in response to specific stimuli acting on endothelial cells. As significant structural foundation of endothelial permeability, cell junctions consist of multi-protein complexes that provide contact between neighboring cells or between a cell and the extracellular matrix. There are three major types of cell junctions: adherent junctions, desmosomes and hemidesmosomes (anchoring junctions), gap junctions (communicating junction) and tight junctions (occludin junctions) . Tight junctions are the closely associated areas of two cells whose membranes join together forming a virtually impermeable barrier to fluid, which consist of some different peripheral membrane proteins located on the intracellular side of plasma membrane and regulate the passage of ions and molecules through the paracellular pathway in epithelial and endothelial cells. The major types are Claudins and Occludins, which could anchor the strands to the actin component of the cytoskeleton, was used in this study to investigate enhancement of paracellular permeability and damage of tight junction with IL-8 introduction. In present study, the underlying mechanisms the effects of IL-8 on endothelial permeability were studied, and the results demonstrated that IL-8 down-regulated tight junction proteins expression, which was associated with an increase in endothelial permeability. Occludin, Claudin-5 and ZO-1 are widely studied, which contribute to alterations in endothelial permeability in response to inflammatory cytokines. However, the expression level and cellular location of Occludin, Claudin-5 and ZO-1 coupled with increase of endothelial permeability are different in various cell lines. Nag S. et al demonstrated that blood-brain barrier breakdown showed a marked loss of Occludin and reduce of localization of Claudin-5 . Aveleira et al indicated that TNF-α increased permeability with a decrease of the protein and mRNA of ZO-1 and Claudin-5, but increased level of Occludin . While Noth et al observed a down-regulation of Occludin without any changes in ZO-1 with an increased paracellular permeability in a murine model of acute graft versus host disease of the small intestine . Tai et al found that amyloid-β could down-regulate Occludin with increased permeability in human brain endothelial cells . 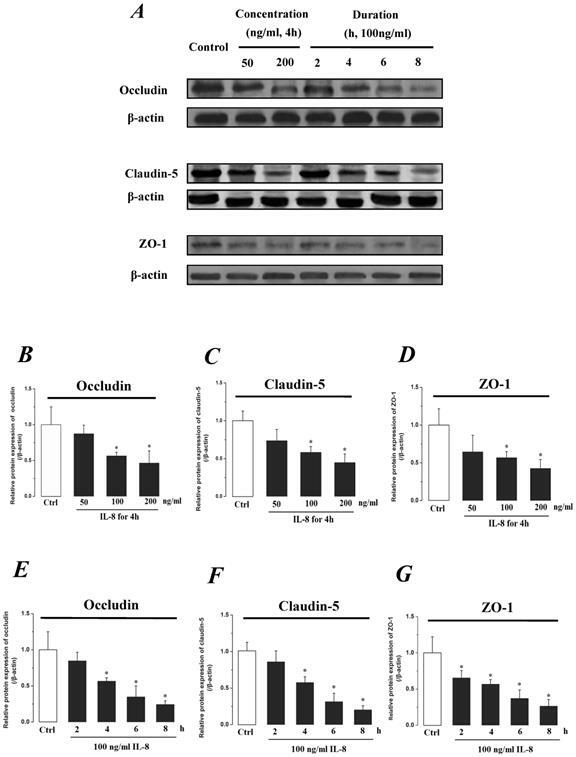 However, we found in this study that IL-8 could down-regulate the levels of Occludin, Claudin-5 and ZO-1 in a dose- and time-dependent manner, which contributed to increase of endothelial permeability. The reason for difference of Occludin, Claudin-5 and ZO-1 expression may be related to differences in cell types and conditions of cell culture. Integrin cytoplasmic tail β binding FAs provides an important structural basis for anchoring the endothelial lining to its surrounding matrices in the vascular wall. The assembly of FAs serves as important signaling events in modulating endothelial permeability under stimulatory conditions including angiogenic factors, inflammatory mediators, or physical forces . Focal adhesion kinase (FAK) is a non-receptor tyrosine kinase functions as the engagement of integrins and assembly of FAs through the catalyzing of several downstream signals and mediates cell behaviors . Integrin- and growth factor-stimulated cues are significant events for activating FAK . It has been found that the endothelial permeability could be regulated by various factors such as transforming growth factor-β (TGF-β)  and VEGF  invovled associated FAK signals. The G protein subunits downstream of protease activated receptor 1 (PAR1) and sphingosine-1-phosphate receptor 1 (S1P1) could initiate phosphorylation of FAK and regulate endothelial barrier function . Activated FAK stimulated by S1P, participates in rearrangement of actin cytoskeletal at the cell periphery, strengthens cell-matrix (FA) and cell-cell (adherens junction) junctional complex, and decreases vascular permeability . In addition, previous reports also demonstrated that IL-8 could induce phosphorylation of FAK via IL-8 receptors CXCR1/CXCR2, and mediate cell migration . Therefore, FAs components including Talin, Paxillin and Vinculin as FAK-binding partners were investigated in this study, and our results indicated that there were no significant differences among their expression level under IL-8 stimulation with different concentration and duration, suggesting that IL-8 regulating endothelial permeability was not dependent upon alteration of cell-matrix adhesions. In this study, the endothelial permeability induced by IL-8 and the mRNA and protein expression level of tight junction components (ZO-1, Claudin-5 and Occludin) were examined. We found that IL-8 regulated the permeability of endothelium by down-regulation of tight junction in a dose- and time-dependence manner. However, the expression levels of Integrins and focal adhesion components showed no significant difference with increased concentration and duration of IL-8 treatment, suggesting that IL-8 induced endothelial permeability may not be dependent upon adhesion behavior of cell-substrate. This finding reveals the molecular mechanism in the increase of endothelial cell permeability induced by IL-8, and it may lead to the development of new therapies that can be applied in pathological conditions involving increase in endothelial permeability. This study was supported in part by grant from National Natural Science Foundation of China (No.11372203, 11172189 and 31300775), Visiting Scholar Foundation of Key Laboratory of Biorheological Science and Technology (Chongqing University), Specialized Research Fund for the Doctoral Program of Higher Education (20120181120058) and the National Science Foundation for Fostering Talents in Basic Research of the National Natural Science Foundation of China (J1103604). Corresponding author: Dr. Yang Shen and Dr. Xiaoheng Liu, Institute of Biomedical Engineering, School of Preclinical and Forensic Medicine, Sichuan University, Chengdu 610041, China. Email: shenyang24com and liuxiaohgedu.cn.